Proceedings of the National Academy of Sciences of the United States of America (PNAS) is the official scientific journal of the National Academy of Sciences, published since 1915. With broad coverage, spanning the biological, physical, and social sciences, the journal publishes "original research of exceptional importance", alongside scientific reviews, commentaries, and letters. In 1999-2009, the last period for which data are available, PNAS was the second most cited journal across all fields of science. PNAS is published weekly in print, and daily online in PNAS Early Edition. PNAS was established by the National Academy of Sciences (NAS) in 1914, with its first issue published in 1915. The NAS itself had been founded in 1863 as a private institution, but chartered by the United States Congress, with the goal to "investigate, examine, experiment, and report upon any subject of science or art". By 1914 the Academy had been well established. Prior to the inception of PNAS, the National Academy of Sciences published three volumes of organizational transactions, consisting mostly of minutes of meetings and annual reports. In accordance with the guiding principles established by astronomer George Ellery Hale, the foreign secretary of NAS in 1914, PNAS publishes brief first announcements of Academy members' and foreign associates' more important contributions to research and of work that appears to a member to be of particular importance. All research papers published in PNAS are peer-reviewed. The standard mode is for papers to be submitted directly to PNAS rather than going through an Academy member. Members may handle the peer review process for up to 4 of their own papers per year—this is an open review process because the member selects and communicates directly with the referees. These submissions and reviews, like all for PNAS, are evaluated for publication by the PNAS Editorial Board. Until July 1, 2010, members were allowed to communicate up to 2 papers from non-members to PNAS every year. The review process for these papers was anonymous in that the identities of the referees were not revealed to the authors. Referees were selected by the NAS member. PNAS eliminated communicated submissions through NAS members as of July 1, 2010, while continuing to make the final decision on all PNAS papers. In 2003, PNAS issued an editorial stating its policy on publication of sensitive material in the life sciences. PNAS stated that it would "continue to monitor submitted papers for material that may be deemed inappropriate and that could, if published, compromise the public welfare." This statement was in keeping with the efforts of several other journals. In 2005 PNAS published an article titled "Analyzing a bioterror attack on the food supply: The case of botulinum toxin in milk" despite objections raised by the U.S. Department of Health and Human Services. The paper was published with a commentary by the president of the Academy at the time, Bruce Alberts, titled "Modeling attacks on the food supply". PNAS is widely read by researchers, particularly those involved in basic sciences, around the world. PNAS Online receives over 21 million hits per month. The journal is notable for its policy of making research articles freely available online to everyone 6 months after publication (delayed open access), or immediately if authors have chosen the "open access" option (hybrid open access). Immediately free online access (without the 6-month delay) is available to 134 developing countries and for some categories of papers such as colloquia. Abstracts, tables of contents, and online supporting information are free. Anyone can sign up to receive free tables of contents by email. Because PNAS is self-sustaining and receives no direct funding from the U.S. government or the National Academy of Sciences, the journal charges authors publication fees and subscription fees to offset the cost of the editorial and publication process. According to the Journal Citation Reports, the journal has a 2014 impact factor of 9.674. PNAS is the second most cited scientific journal, with nearly 1.4 million citations from 1999 to 2009 (the Journal of Biological Chemistry is the most cited journal over this period). PNAS has received occasional criticism for releasing papers to science journalists as much as a week before making them available to the general public; this practice is known as a news embargo. According to critics, this allows mainstream news outlets to misrepresent or exaggerate the implications of experimental findings before the scientific community is able to respond. Science writer Ed Yong, on the other hand, has claimed that the real problem is not embargoes themselves, but the press releases issued by research institutes and universities. In January 2011, PNAS started considering manuscripts for exclusive online publication, "PNAS Plus" papers. These have a larger maximum page limit (10 rather than 6 pages). Accompanying these papers both online and in print was a one- to two-page summary description written by the authors for a broad readership. Since mid-October 2012, PNAS Plus authors no longer need to submit author summaries and are instead asked to submit a 120-word-maximum statement about the significance of their paper. The significance statement will appear both online and in print. Since July 15, 2013, the significance statement is required for all research articles. In 2006 PNAS launched a new section of the journal dedicated to sustainability science, an emerging field of research dealing with the interactions between natural and social systems, and with how those interactions affect the challenge of sustainability: meeting the needs of present and future generations while substantially reducing poverty and conserving the planet's life support systems. See the Sustainability Science portal at: http://sustainability.pnas.org/. ^ Alan Fersht (May 3, 2005). "Editorial: How and why to publish in PNAS". PNAS 102 (18): 6241–6242. doi:10.1073/pnas.0502713102. PMC 1088396. PMID 16576766. ^ Eugene Garfield (September 7, 1987). "Classic Papers from the Proceedings of the National Academy of Sciences" (PDF). Essays of an Information Scientist 10 (36): 247. Retrieved 2007-09-28. ^ Schekman, Randy (2009). "PNAS will eliminate Communicated submissions in July 2010". Proceedings of the National Academy of Sciences 106 (37): 15518. doi:10.1073/pnas.0909515106. ^ Cozzarelli, Nicholas R. (2003). "PNAS policy on publication of sensitive material in the life sciences". Proceedings of the National Academy of Sciences 100 (4): 1463. doi:10.1073/pnas.0630514100. PMC 149849. PMID 12590130. ^ Harmon, Amy (February 16, 2003). "Journal Editors to Consider U.S. Security in Publishing". New York Times. ^ Wein, L. M. (2005). "Analyzing a bioterror attack on the food supply: The case of botulinum toxin in milk". Proceedings of the National Academy of Sciences 102 (28): 9984–9989. doi:10.1073/pnas.0408526102. ^ Alberts, B. (2005). "Modeling attacks on the food supply". Proceedings of the National Academy of Sciences 102 (28): 9737–9738. doi:10.1073/pnas.0504944102. ^ "PNAS electronic table of contents". PNAS website for signup and setting management. ^ "Proceedings of the National Academy of Sciences of the United States of America". 2014 Journal Citation Reports. Web of Science (Science ed.). Thomson Reuters. 2015. ^ "Top Ten Most-Cited Journals (All Fields), 1999–2009". 2012. Retrieved June 1, 2012. ^ a b Yong, Ed (2009-08-16). "Does Science Journalism Falter or Flourish Under Embargo?". NationalGeographic. Retrieved 2013-08-16. ^ Liberman, Mark (April 22, 2009). "Debasing the Coinage of Rational Inquiry: a Case Study". Language Log. Retrieved April 22, 2009. ^ Timmer, John (2009-04-16). "Social Media Threats Hyped by Science Reporting, Not Science". Ars Technica. Retrieved 2009-04-20. ^ Schekman, R. (2010). 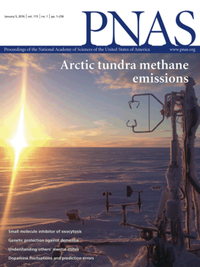 "Editorial: Creating a new option for online-only research articles: PNAS Plus". PNAS 107 (35): 15309. doi:10.1073/pnas.1011179107. ^ Verma, I. (2012). "PNAS Plus: Refining a successful experiment". PNAS 109: 13469. doi:10.1073/pnas.1212313109. This page was last modified on 24 February 2016, at 22:30.